Preheat oven to 150°C/300°F. Finely chop shallots and garlic. Pluck tarragon leaves and chop finely. In a small bowl, mix together one third of the chopped tarragon and all the mustard. Coarsely chop hazelnuts, place on a baking sheet, and roast in the oven for approx. 8 min. Set aside. Increase oven temperature to preheat at 175°C/350°F. Rinse rabbit pieces under cold running water, drain, and pat dry. Season with salt and pepper. Heat vegetable oil in an oven-proof pot and sear rabbit pieces on all sides. Remove meat from the pot and set aside. Add some more vegetable oil to the pot and add half of the chopped shallots, garlic, thyme and rosemary leaves. Sauté for approx. 1 – 2 min., until fragrant. Deglaze with brandy and white wine, reduce heat and continue to simmer for approx. 10 min., or until reduced by approx. one third. Scrape off any browned bits on the bottom of the pot with a wooden cooking spoon. Brush rabbit pieces with two-thirds of the mustard-tarragon marinade and return to pot. Add chicken broth, cover pot, and transfer to the oven to roast at 175°C/350°F for approx. 45 min. To make the bread dumplings, melt most of the butter in a frying pan. Add remaining chopped shallots and sauté for approx. 2 – 3 min. In a small bowl, whisk together milk and eggs. Season with salt and pepper. Roughly tear the bread rolls into a large bowl so that you end up with a mixture of small to large pieces, combine with the egg-milk mixture and let rest for approx. 10 min. Add flour, sautéed onions, and ground hazelnuts to the mixture. Bring a large pot of water to the boil. Lay a large piece of plastic wrap onto your work surface. Place the dumpling mixture along the edge closest to you, leaving space around all the edges. Pick up the edge plastic wrap closest to use it to help you roll the mixture into a tight log. Fold over the excess plastic on the ends, tightly roll the log in another piece of plastic wrap, and twist the ends tightly to close. Gently lower the dumpling log into the boiling water, reduce hit to medium-low, place the lid on, and let simmer for approx. 12 min., or until the log begins to float. Cube remaining butter. Remove pot from the oven, use tongs to turn over the rabbit pieces, and brush with remaining mustard-tarragon marinade. Dot the remining butter pieces on top and let roast in the oven for approx. 10 min. further. Turn off the oven and transfer the pot to the stove. Remove the rabbit pieces and place on a plate. Let the cooking liquid in the pot simmer and reduce on medium heat for approx. 2 min. Add crème fraiche and remaining tarragon, stir well, and season with salt and pepper. Add the rabbit pieces back to the sauce and remove from heat. Slice bread dumplings into thick discs. 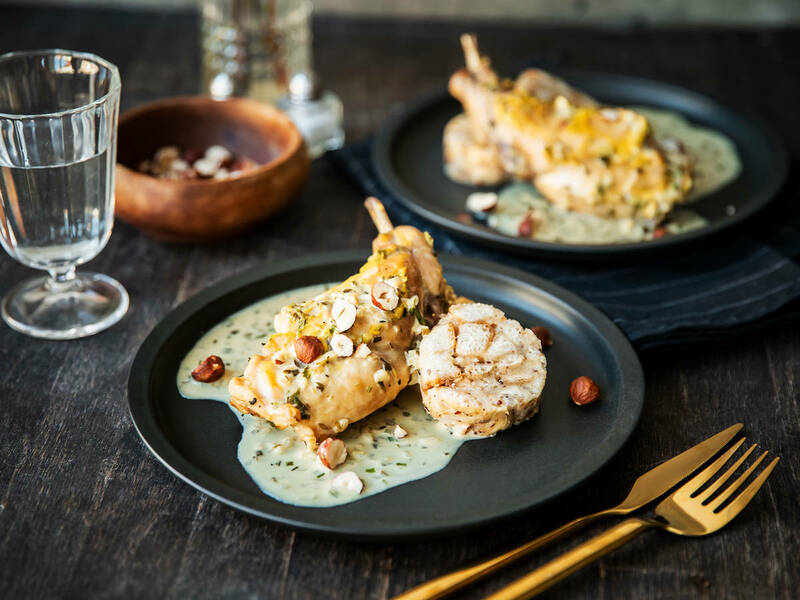 Serve the rabbit with the bread dumplings and garnish with roasted hazelnuts. Enjoy!